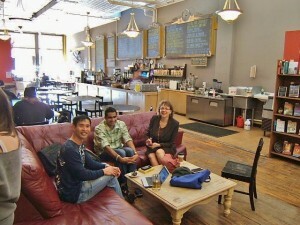 We meet every Monday evening from 5:30-7:00 P.M. at the Bean Cycle in Old Town Fort Collins. We usually meet upstairs above the Matter Bookstore or—if no tables are available—downstairs in the café on the sofas or around a table. We love the Bean Cycle due to the bike theme, featured artwork, spaciousness, and friendly staff. Please help them love us back by, for example, purchasing a drink. See our blog for meeting notes. ¡Gracias y nos veamos pronto!